The University of Arizona's MS in Cybersecurity is designed for working professionals who want to gain technical mastery in the rapidly growing field of cybersecurity. The UA Master's in Cybersecurity is a unique joint program between three of the strongest departments at the University of Arizona: the Department of Management Information Systems at the Eller College of Management and the Department of Electrical and Computer Engineering and Department of Systems and Industrial Engineering at the College of Engineering. 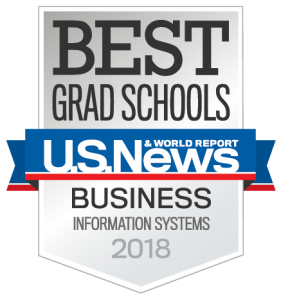 In fact, the MIS graduate program is ranked #4 nationally in the latest U.S. News & World Report rankings while the Master's in Cybersecurity is ranked #7 nationally by Cyber Degrees. In this challenging yet inclusive online Master's in Cybersecurity program, students learn how to assess, prevent, and manage information and systems security-related risks by applying systems security management and post-breach practices through hands-on, interactive classes taught by the UA's excellent faculty. The 33-credit, interdisciplinary cybersecurity program enables students to complete a common core of courses and then select either the Information Systems or Physical Systems track. Get program details, including tracks, course structure, and certificates.